Corrine’s diamond butterfly clasp pearl necklace is such an important detail in the Dollanganger saga. It is spoken of in the first three books , having created a lasting impression with both the Dollanganger children and in turn, the readers. AtticSecrets were thrilled when the wonderful Julianne Hannes (expert at tracking things down) posted an exact picture of what this necklace would look like. Not only beautiful , rare and exspensive according to Jules research , the necklace itself represents so much within the story , strategicly placed in its first appearance right down to its last. Personally, I think those pearls are symbolsing a restriction from all the truth , pain and emotions caught in her internally. Stuck in her throat , the way she plays with it when nervous like shes trying to stop it coming out ……and she always twists those pearls when she is lying as Jules points out….twisting the truth in a psychical form. 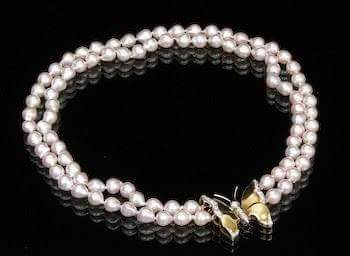 The pearl necklace that Cathy and her siblings vividly recall first appear when Corrine returns from her European honeymoon , that long long summer of suffering the children endured… they are present when Corrine delivers the news she has remarried and her displeasure displayed when she realises her children are no longer as trusting. This is the scene where Corrine behaves so childishly, emotionally manipulating the children , making them feel guilty for not being pleased at her news before storming out and punishing them further by staying away for another ten days. But why a diamond Butterfly clasp ? This tells us symbolically that at this point of the story, Corrine has shed her old life completely, she is no longer the widow Mrs Dollanganger from Gladstone with its baggage and sin , She is now the beautiful Foxworth Heiress and Mrs Winslow , her father has “forgiven” her and allowed her to remarry whilst still inheriting. 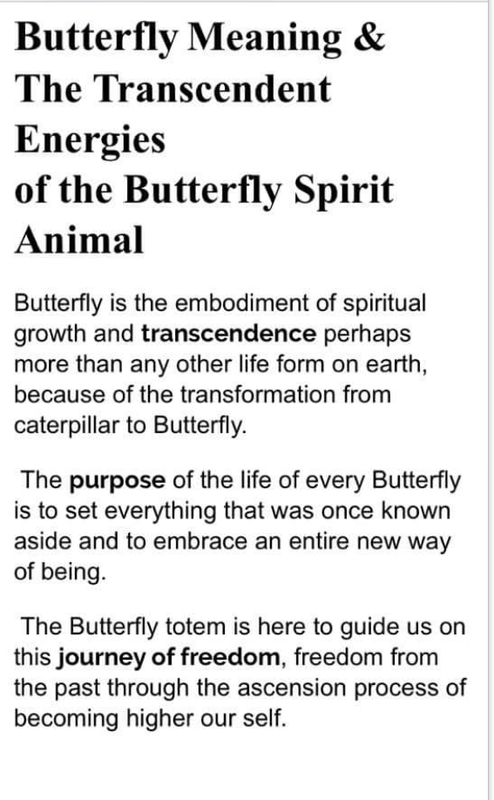 Its actually a subliminal message, a dire warning because a butterfly doesnt carry on with any traces of its former self, the caterpillar. Gladstone Corrine is no more. Meaning her responsibility as a mother is no more. This is further proved in the tragic suicide of Carrie , who confirms Corrine was wearing that necklace when she denied Carries existence as her child. But whilst we see what those pearls symbolised within Corrine, just what did those pearls represent to her children ? 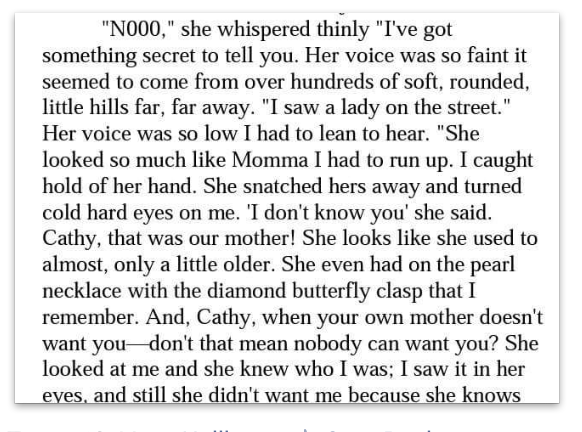 The fact that Cathy ripped apart the necklace pearl by pearl, literally, is very telling, that’s quite the symbolism, with each pearl representing the normal experiences they were all robbed of having. Those pearls were paid for by her own childrens blood , sweat and tears , every single bead. Thats the genius of Virginia s writing that she can use something so seemingly simple as a fancy piece of jewellery to tell us so much more about the story and its characters. And thats whats so wonderful about AtticSecrets , we have wonderful members such as Jules and Ted who bring such fascinating insight into the group , who bring another dimension into the stories we love and a way to discover more about them.